New Horizons has now covered 85% of the distance from the Sun to Saturn’s orbit, which it will pass in mid-2008. Of course, Saturn will be nowhere near New Horizons when we pass that milestone, as it is by chance located far around the Sun from the path New Horizons is following to Pluto. But as you can tell, we are really getting to be well into the outer solar system now. Since I last wrote you, in early October, the New Horizons team has been busy on two major fronts. One of these has been planning and executing our 2007 Annual Checkout (ACO) of the spacecraft and its payload. As our first ACO, this three-month operation has been a pathfinder for the team, teaching us how to make improvements for subsequent ACOs in 2008, 2009 and beyond. The other front we’ve been working on is Pluto encounter planning. As I’ve written here before, we are planning for Pluto now, to take advantage of the experienced team that took us through our virtually flawless Jupiter encounter earlier this year. 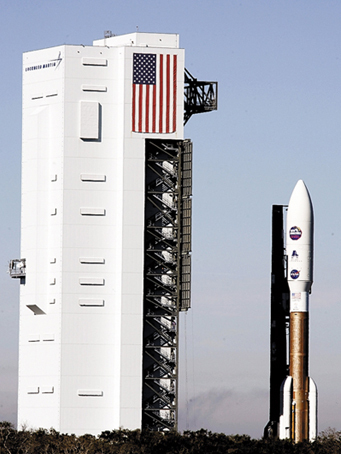 New Horizons rolls out to launch on January 16, 2006. The trees in the foreground reveal the vehicle’s true size. Budget constraints will force us to slim down the team in mid-2009, so we need to finish the Pluto planning before many of the Jupiter encounter team members move on to other projects. Our first Annual Checkout just wrapped up, after more than 500 separate spacecraft and instrument activities; and it was a great success. We also used the data gathered to recalibrate our instruments — something we’ll do several times as we fly out to the Pluto system. As you know from my last posting here, we also planned and successfully accomplished an engine burn during ACO-1. This maneuver refined our course and dramatically narrowed our expected trajectory errors at Pluto. We did have a couple of unexpected events during ACO-1. One came in early October, when the spacecraft partially lost track of its timeline owing to a very subtle kind of error generated by a command script we’d sent it. The operations team caught this and recovered from it very quickly. It was really a blessing that this subtle behavioral flaw manifested itself now, rather than at Pluto, so we can protect against it. It’s these kinds of idiosyncrasies that our testing and flight operations hope to expose. So, despite the fact it cost us some lost sleep and some cruise science observations, we’re very glad to have learned this lesson. The second unexpected event came just last week, on November 12, when a cosmic ray or some other kind of charged particle caused our main computer to reboot. This is the fourth such computer reboot we have had in flight caused by space radiation bursts. Preflight predictions were for these events to be far more rare than this, and our engineering team is looking into why this is occurring more often than predicted. Fortunately, on the four occasions this occurred, the onboard spacecraft autonomy software performed as planned and recovered New Horizons safely. The third and final such event took place on November 16, when the spacecraft’s main computer executed a power on reset (POR) because of a glitch on its power line. Since this was so unexpected, we are analyzing what happened and have decided not to enter hibernation until late December while we analyze the root cause of this anomaly and put in place some software protection against future events. For the next couple of weeks, we’ll monitor the spacecraft three to four times a week using NASA’s Deep Space Network to collect more data. Then, between December 11 and 17, the spacecraft will pass near the Sun as seen from Earth. (Don’t worry, New Horizons really is out in the frigid cold near Saturn, it just appears to be near the Sun when seen from Earth’s vantage point.) This event is called “solar conjunction” and it occurs every year as the Earth itself reaches a point nearly opposite the Sun from New Horizons. As during last year’s solar conjunction, we will lose contact with New Horizons due to radio interference from the Sun, which will be just one to three degrees away from New Horizons and in our tracking antennas’ field of view. 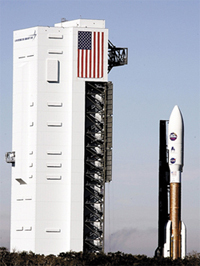 December 17, the day we exit this year’s solar conjunction, is an anniversary for us; on that day in 2005, New Horizons was lifted onto its Atlas launch vehicle down in Florida. It’s a nice coincidence to note that precisely 102 years before that day, in 1903, the Wright brothers made their first flight at Kitty Hawk. As we exit solar conjunction on December 17, we’ll have a fairly intense week of activity. During that week we will re-point our dish antenna to better position it for communications with Earth and play back recorded engineering and Student Dust Counter detector telemetry. The team will also prepare the spacecraft for a long period of hibernation that will begin on December 23 and continue uninterrupted (we hope!) until next May, when we next break hibernation for about a week to reposition our antenna again for better communications with Earth. We’ll use that operations opportunity in May to send home some of the lower priority “cruise science” data taken this month that couldn’t be squeezed down during ACO-1. Then, we’ll go back to silent running until ACO-2 begins late next September. During the almost 40 weeks we’ll be in hibernation in 2008, we won’t be sending commands to the spacecraft. But we will check its health via weekly beacon tones and (beginning in early 2008) monthly telemetry sessions. Many of you may notice that this is a less frequent set of checks than we performed in 2007. That’s because as we gain experience with the spacecraft in hibernation mode, we can reduce the oversight we perform on it. This “lengthening of the leash” as I like to call it, is something we have planned for years. And unless something untoward occurs, this pace of weekly beacon tone and monthly telemetry checks is how we will run hibernation activities in future years on the way to Pluto. That’s my update on mission activities for now, but before I close I’d like to show you two things related to the Pluto encounter we are now beginning to plan. 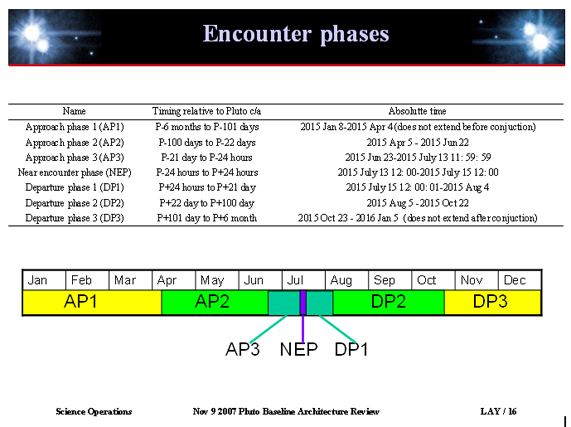 Figure 1 shows the “block schedule” that defines our Pluto system encounter phases. 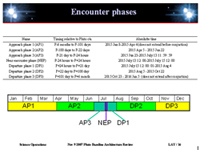 By studying this figure you will see that we plan to begin the encounter operations about six months before reaching Pluto, and we do not finish — including all of the data transmissions and plasma and dust environment measurements — until six months after the July 14 encounter itself. Of course, most of the action occurs in the roughly two-month period centered on encounter day, when our resolution and sensitivity are dramatically better than anything Earth-based and Earth-orbiting telescopes can match. New Horizons’ encounter with the Pluto system will span a year, in which there will be three successively closer approach phases (APs 1, 2 and 3), a near encounter phase (NEP) lasting two days, which will be followed by three successively more distant departure phases (DPs 1, 2 and 3). Click on the image to see a larger version. Figure 2 provides a view of the Pluto system at our moment of closest approach. It shows where the spacecraft will be at its moment of closest approach to Pluto, relative to Pluto and all three of Pluto’s satellites, i.e., at the green “+” symbol. As you can see, we will be 13,700 kilometers from Pluto’s center and therefore 12,500 kilometers from its surface. You can also see that Nix and Charon are arrayed on different sides of the spacecraft at roughly similar distances, but Hydra is considerably farther away, off in the rough direction that Charon will appear to be. 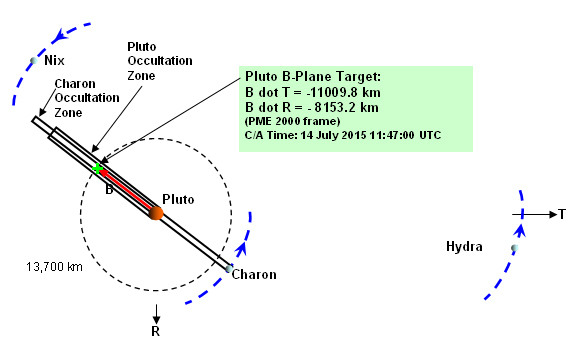 The geometry of Pluto and its three satellites – Charon, Nix and Hydra – are shown here relative to our spacecraft aim point (the green “+”) at the moment of closest approach (C/A) to Pluto. Click on the image to see a larger version. In the coming year while our beauty sleeps, we will plan this encounter in great detail, leading up to a full suite of rehearsals on our mission simulator in 2009, which will in turn lead to rehearsals on New Horizons itself in 2010. As 2008 unfolds, I’ll keep you apprised of many of the interesting things we plan to do during the Pluto encounter and how we plan to do them. Well, that catches you up with where New Horizons is and what the spacecraft and project team have been doing. I’ll be back with more news around the start of the new year. In the meantime, keep on exploring, just like we do!